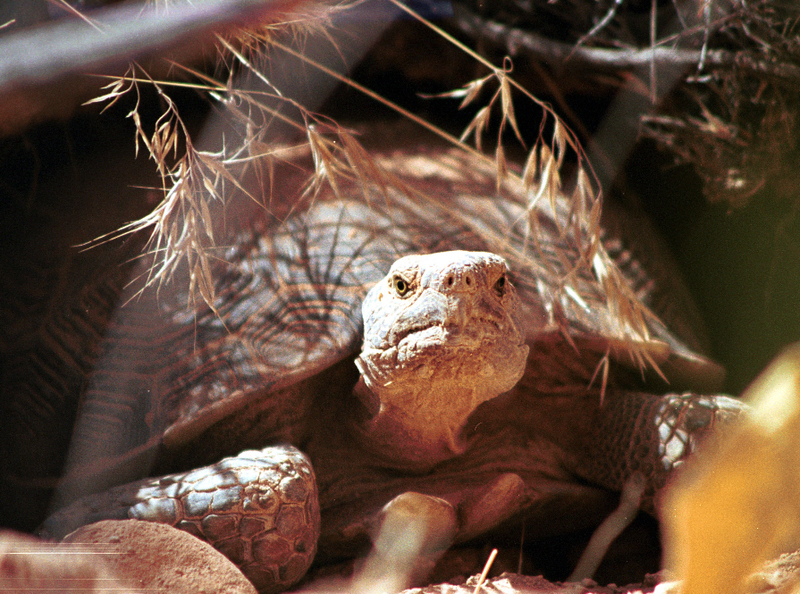 Desert Tortoise (Gopherus agassizii) photo by Beth Jackson / National Park Service Image Library. Also called gopher tortoise, the desert tortoise lives in the deserts of southern California to southern Nevada, western Arizona, and northern Mexico. Listed as threatened, the desert tortoise population has decreased by 90% since the 1980s due to vandalism, predation, disease, and collection for pets (now illegal). Habitat loss from mining, livestock grazing, off- road vehicles, and development are also major factors threatening this ancient animal. Another problem is that females do not breed until they are 15 to 20 years old, and then may lay eggs only when adequate forage is available. Only 2- 3 percent of hatched tortoises live to adulthood. Natural predators of the desert tortoise include ravens, gila monsters, kit foxes, badgers, roadrunners, coyotes, and fire ants. They prey on eggs, juveniles (with a thin, delicate shell), and sometimes adults. Growing to a length of 15 inches (males are larger than females) with a high domed shell, the desert tortoise spends about 95 percent of its life in burrows that allow escape from heat or cold. The desert tortoise is an herbivore, with a diet of grasses, herbs, wildflowers, some shrubs, and new growth of cacti (as well as their fruit and flowers). Rocks and soil are also ingested, probably to enable more efficient digestion of plant material in the stomach (as with birds. Much of the tortoise’s water intake comes from moisture in the grasses and wildflowers they consume in the spring. A large urinary bladder can store over forty percent of the tortoise's body weight in water, urea, uric acid and nitrogenous wastes. During periods of rainfall, they drink copiously from any pools they find. Adult tortoises can survive a year or more without access to water. One defense mechanism the tortoise has when it is handled or molested is to empty its bladder. 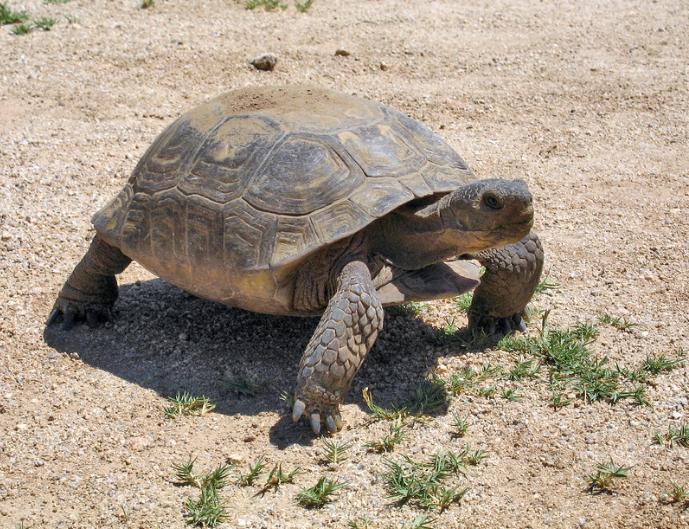 This can leave the tortoise in a very vulnerable condition in dry areas, and they should never be alarmed, handled or picked up in the wild (It is unlawful to touch, harm, harass or collect wild desert tortoises). Desert tortoise (Gopherus agassizii); NPS photo by Robb Hannawacker (courtesy of Joshua Tree National Park on Flickr; use permitted with attribution).